One of the ways people have responded to the horrors of Newtown has been through the use of social media. I don’t know if my experiences are typical, but I actually learned about Newtown from posts on Facebook, and over the ensuing hours my Facebook feed was filled with responses to the tragedy. My initial impression was that what started as an outpouring of grief and anguish began to crystallize into anger at the status quo, which in turn gave way to calls for political action. Moving from the anecdotal to the more systematic, here is a list of the number of tweets featuring prominent trending hashtags and terms in the hours after the shooting. The data were collected starting at 7:00 PM EST on Friday and run through the end of Monday, December 17th. Upon first glance, we can see that while there are over 700,000 tweets that include either the hashtag #prayfornewtown or some version of the town’s name (e.g., the singer Nick Jonas tweeted “My heart is heavy today hearing the news about Newton, CT. Praying for all the family and loved ones effected by this”), there are just as many tweets specifically referencing either the NRA or gun control (e.g., BBC newscaster Andrew Neil tweeted “If brave teachers can stand up to a gunman – and lose their lives in the process – why can’t US politicians stand up to the NRA?”). 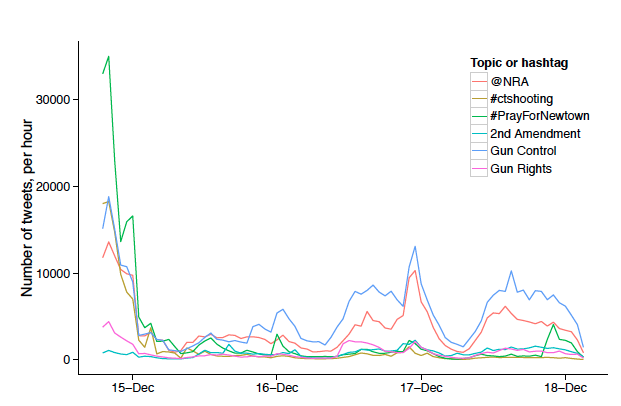 If we expand the political terms to include “guns” (e.g., commentator Charles Garcia tweeted “Gov’t regulates ladders which kill 300 Americans a year, more than guns, which kill 30,000!”) then the number of (potentially) political tweets in the sample significantly exceeds those that simply refer to Newtown. Two trends are worth noting. First, apropos of this previous post on The Monkey Cage about declining attention to gun tragedies, use of all of the terms drops dramatically after Americans go to bed on Friday, and never returns to the levels to which they originally rose. It is interesting to note that after a lull on Saturday, tweets begin trending upward again Saturday evening, throughout the day on Sunday, and then again during the day on Monday. With the caveat here that we are only looking at trends over three and a half days – the data referenced in The Monkey Cage post is over the course of weeks – it does seem that Twitter offers another useful window into public attention to these types events. If so, then we should be able to use Twitter going forward to learn if public attention can be sustained over a longer period of time now as compared to previous tragedies of this nature, or, to put it another way, if this time will be different. Second, and perhaps more importantly, the data do seem to confirm my initial anecdotal impression of emotional responses morphing into more political ones. By far the most popular hashtag on the day of the shooting is #prayfornewtown. However, as we get late into the day Sunday and throughout Monday, “gun control” and #NRA emerge as more popular Tweets. While we of course need to get a better understanding of the content of these tweets before we make any definitive conclusions, at first glance this seems consistent with a picture of initial emotional responses giving way to a call for more political responses. This observation is consistent with a growing literature on emotion and politics that suggests that anger and fear can motivate political participation. Whether political action is forthcoming in the aftermath of Newtown remains to be seen, but perhaps following Twitter in the coming weeks can provide important clues as to whether this will or will not be the case.